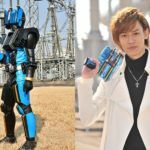 Kamen Rider DiEnd DX Neo DiEnd Driver Revealed! 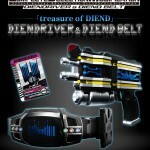 To celebrate the return of dimension-hopping treasure hunter Kamen Rider DiEnd, Bandai Japan is releasing an updated DiEnd Driver! The cards in question are also shown to be compatible with the previously-announced DX Neo DecaDriver. Sadly, price & release details for the DX Neo DiEnd Driver have not been announced at time of writing. Stay tuned to TokuNation for further details! 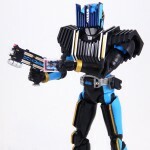 Hot off the hells of the CSM DecaDriver release, Premium Bandai went ahead and opened the official web page for the Complete Selection Modification Diend Driver! At the moment, it isn’t known if the Driver will have a working card scanner or new sounds like the Deca Driver has, for now all we know is that it will include Diend’s belt plate as well. Will cost 17280 yen, pre orders will open April 24th and will run till July 6th 2015 with a shipping date of October. Premium Bandai will reveal more information on this piece when pre orders open on the 24th. 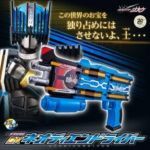 As collectors begin to receive the newly released Complete Selection Modification Kamen Rider Decade Decadriver, Bandai have also teased the next release in this line of more highly-detailed belt reissues. 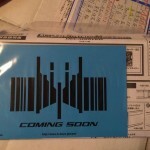 Included in the instruction sheet’s plastic wallet is a blue card featuring the emblem of Decade’s secondary Rider Kamen Rider Diend, along with the words “coming soon”. While a Complete Selection Modification Diend Driver will undoubtedly feature more detailed paint applications than its mass release toy counterpart, whether it will feature a proper card scanner (something the original sorely lacked) is yet to be known. We’ll bring you more news on this item as it’s released in the future! Just because Kamen Rider Decade is years and years old now doesn’t mean we don’t still have some cards up our sleeve! We are very happy to present to you a review and a gallery from an older figure from the S.H. 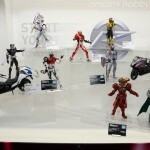 Figuarts line, which is none other than Kamen Rider Diend. Courtesy of our photo contributor ryan, we have 26 images to share with you of this character from one of the popular (and debated) Kamen Rider series! But just like every figure out there this one has some flaws. What are they, and does ryan think this older figure compares at all to the newer body styles found in the S.H. Figuarts being released today? Click here for the full gallery and review, then share your thoughts on Kamen Rider Diend! 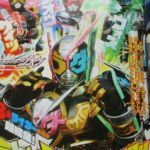 The OCN Animation blog has made a new post releasing info about the forthcoming Kamen Rider x Super Sentai: Super Hero Taisen movie, dubbing it to be the “greatest battle in history”! This post contains new info about both the plot and cast. A translation has been provided on Henshin Justice Unlimited courtesy of member Nerefir. We’ve copied the translation, which can be viewed by clicking the title of this story. 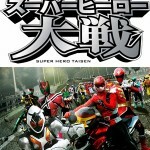 In addition to all of this, the official website for Kamen Rider x Super Sentai: Super Hero Taisen is now open!